Spring is here and I know you are anxious to be in the garden. As soon as the temperatures begin to climb it is really tempting to get seeds in the ground. Before you take that step, however, I encourage you to make sure the ground is ready for your seeds. Of course, you will loosen the soil and add compost and, if necessary, organic fertilizers, but did you take the temperature of the soil? Seeds are naturally programmed to germinate and grow within a certain range of temperatures. Within that range they will grow faster or slower, depending on their comfort zone. It has been my experience that just because it is the right time to plant on the calendar, it may not be the right time to plant according to the soil. The temperature of the soil is more important than the date on the calendar. When I was a market gardener I would be anxious to get sugar snap peas in the ground in early March. I would put in another planting two weeks later. If the weather had been too cool, the first planting may not come into production until the second planting did. I learned to pull back the leaf mulch that covered the bed over the winter and put down a sheet of plastic two weeks before planting the sugar snaps to warm the soil. If the weather has been too cool and wet there is the danger that the seeds will rot and not germinate at all. Peas, beans, and corn are most susceptible to this, which is why you might find those seeds for sale coated with fungicide. Steer clear of fungicide coated seeds and plant at the right time. Beans and corn like the soil to be 60° F (15.6 °C) and cowpeas would like it if you wait to plant until it warms to 65° F (18.3°C). If you have mulch covering some of your garden beds, go out and stick your hand in the soil under the mulch and then put your hand in the soil in a bed without mulch. You will feel a noticeable difference in the temperature. During the winter an organic mulch such as leaves or straw does a good job of protecting the soil and providing habitat for the earthworms. However, when things begin to warm up in the spring the mulch will insulate the soil from the sun’s rays. Removing the mulch two weeks ahead of planting will help to warm the soil. I am not so much in a hurry these days, so I don’t use plastic to further warm the soil, but it is an option. With my system of cover cropping, when the cover crop is finished, it is naturally time to plant the next crop. 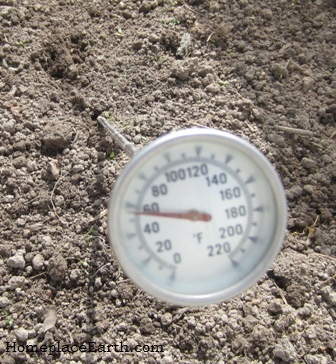 You can monitor the temperature of the soil with a thermometer or by sticking your hand in the ground. Even better, go barefoot. There’s nothing like the whole body experience. You might want to use a thermometer until you can gauge the temperature by touch. I use either a 20” long compost thermometer with a 1¾” face (top photo) or a thermometer with a 5” stem and 1¼” face that I bought at the grocery store. I keep the long thermometer stuck in the soil somewhere so I don’t lose it. Usually it is in my coldframe, where it is right now. The nice thing about the compost thermometer is that it is easy to read without bending over too much. The small thermometer has so many uses. It comes with a plastic sleeve that has a pocket clip –handy if you are going to be carrying it around. The one you see in the photo is the one I use to monitor the temperature in my solar food dryer. It sticks through a hole drilled for that purpose with just the gauge showing on the outside of the dryer. 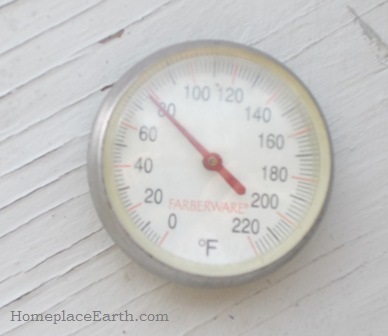 A small thermometer such as this can be used in the kitchen, which is why you will find it in the grocery store. You can find a chart showing a list of crops and the minimum, optimum, optimum range, and maximum soil temperature conditions for each in How to Grow More Vegetables by John Jeavons. A chart I find interesting is Days to Appearance of Seedlings at Various Soil Temperatures from Seed Planted at ½” Depth, compiled by J.F. Harrington. You can find it with an Internet search. It shows the number of days it takes for each crop to germinate at different temperatures. For example, peas will take 36 days to germinate at a soil temperature of 41°F (5°C), 13 days at 50°F (10°C) and 9 days at 59°F (15°C). You can see how warming up the soil will contribute to an earlier crop. Peppers, on the other hand, are shown to take 25 days to germinate at 59°F, 12 days at 68°F (20°C) and 9 days at 77° F (25° C). If you plant pepper and tomato seeds at the same time, the tomatoes will germinate first—in 14 days at 59°F, 8 days at 68°, and 6 days at 77°. I start my seeds in my coldframes, which provide cooler temperatures than starting them in the house. I put tomato, pepper, and other seeds of warm weather crops in my coldframe during the last week of March. 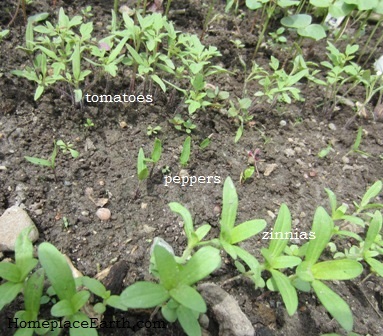 Since I save much of my own seeds, I am developing strains of each crop that will germinate in cooler soil. The healthy plants that I take out of the coldframe are the ones that have germinated and thrived in the cooler conditions. The peppers that I have been most successful with in the coldframe are Corno di Toro and Ruffled Hungarian. By saving your own seeds, you can develop strains of your crops that will germinate and grow under the conditions that you want to work with. Experiment with planting times and conditions in your garden. I would advise, however, to only take chances with what you can afford to lose. If you go into it with that attitude, you won’t be disappointed. Sue, you are right. I addressed that problem in the blog post I recently wrote for New Society Publishers at http://www.newsociety.com/blog/2015/Seed-Starting-with-Cindy-Conner. With a growing zone of 7, I can understand you not using anything but the cold frames for starting seeds. Do you feel that any of the colder zones can also just use the cold frame method? We are in zone 6 with our last frost date May 15. Yes, Eliot Coleman’s first work was only with coldframes. I like them because I can use them year round with lids, no lids, shade cloth, etc. I had a 12×20 greenhouse for 5 years. It was great in the winter, but way too hot in the summer. I could have taken off the plastic, each summer, but when the plastic needed to be replaced I decided to work with low tunnels on my garden beds and coldframes instead of messing with a greenhouse.